Maybe earwigs are only a nuisance, the way they come skittering out of the florets of a prized dahlia. But sometimes, these creepy dahlia pests are guilty of damaging your dahlia's foliage as well as chewing the flowers and being an unsightly nuisance. If your dahlia garden is afflicted with earwigs, they're likely the European earwig Forficula auricularia, flattish black or reddish-brown critters from half an inch to 1 1/4 inches long with a distinctive forceps-like appendage at the base of its abdomen. Like slugs and snails, earwigs are primarily scavengers, says Judy Sedbrook, a Master Gardener with Colorado State University Cooperative Extension. 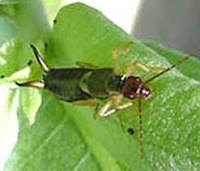 (Earwigs aren't all bad; Sedbrook notes that they are natural enemies of some dahlia pests like mites and aphids.) And like slugs and snails, earwigs are largely nocturnal and fond of moist habitat. In the daylight, they seek out hiding places, congregating under garden debris (they lay their eggs in the soil in such sheltered places) or taking refuge in the convenient tubelike florets of your dahlia blossoms. 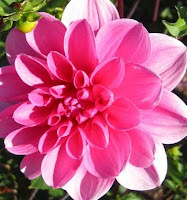 At Lynch Creek Farm, where the gang markets dahlia blooms in summer as well as beautiful dahlia tubers for your home gardens, Andy and Nathanael offer this advice: if you suspect your dahlia flower may harbor an earwig or two, dip it into a bucket of cool water. The bug or bugs will wriggle out immediately, and you can leave them swimming. Get rid of earwig habitat, such as boards, debris piles, dirt clods, ivy and weeds. Encourage natural predators such as birds and toads. Maintaining some natural areas can help with this, so long as they don't provide moist refuges for earwigs. Make earwig traps with low-sided tuna or pet-food cans filled with half an inch of vegetable oil; dump oil and earwigs when they fill. Or put out rolled newspapers or sections of hose in the evening; in the morning, shake earwigs out into a bucket of water. Continue trapping until you no longer attract earwigs. An unsightly nuisance, yes. Destructive of your plants, sometimes. But we have to say this on behalf of earwigs: they don't crawl into your ears and eat your brains. That, at least, is an old wives' tale. Garlic is supposed to fend off vampires and discourage some garden pests. But this time, we're recommending it as a snail-control component — not for its natural bug-repelling qualities, which we're not so sure about, but as an ingredient in a delicious way to reduce the snails in your garden and protect your beautiful dahlias from damage from those shell-bearing dahlia pests. Jaden Hair, a professional recipe developer, food columnist and food photographer, maintains a site called Steamy Kitchen, and on that site you'll find her fabulous recipe for escargot with garlic butter and a splash of cognac. That's her photograph on the left; doesn't it look wonderful? Below, you'll find out how to use snails on the hoof instead of the canned variety. Elegant and delicious, escargot may have been the reason we've been afflicted with Cornu aspersa (formerly Cantareus asperses, formerly Helix aspersa) in the first place. In Wintergreen: Rambles in a Ravaged Land, Robert Michael Pyle says noted Northwest restaurateur Tony Kischner, when he was proprietor of the Shoalwater Restaurant in Seaview, received a letter from the Washington Department of Agriculture asking that he stop rearing the snail for the kitchen. 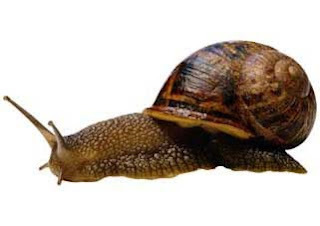 Kischner, Pyle reported, "had long since given up the chancy practice of snail husbandry in favor of foraging for wild mollusks in the nearby woodlands, where they occur commonly. The results drew praise from many of the restaurant's customers..."
A note of caution about gathering snails for gastronomic purposes: if you use non-organic pesticides in your garden, head for the woods to find your snails. Foraging for snails away from your garden may not directly reduce your snail population, but in the long run it can help reduce the armies that move in from the wild. To prepare those dahlia pests, the snails, for cooking, put them into a container without food for two days so that they empty their intestines. Rinse them frequently to rid them of any toxins. When you're ready to prepare them, remove them from the container and wash them thoroughly. Plunge them into boiling water seasoned, if you like, with onion and celery tops and a little wine, and boil for five minutes. Or, if you prefer, you can put them into the freezer to kill them, but that seems sort of passive and shabby, somehow. When they've cooled (or frozen and thawed), remove them from their shells, using tweezers or a hook. Remove the operculum (shell door), the body and intestines; the foot is the part you want to eat. If you want to serve your escargot in their shells, rinse the shells repeatedly and boil with baking soda to thoroughly clean them. You can serve snails without the shells, but they make kind of a nifty presentation. 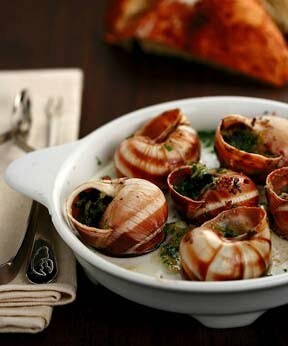 Click here for more escargot recipes. If you work your way through the whole repertoire, consider this: while you're earning a reputation as a gourmet cook, you're ridding your neighborhood, your garden and your dahlias of pestiferous predators and their potential progeny. "Know thy enemy and know thy self and you will win a hundred battles" is the well-known advice of Sun Tzu Wu in The Art of War. Ask most gardeners who grow dahlias what pest gives them the most grief and inevitably the answer is slugs. The war on slugs wages hot with most of us who want the brilliance of dahlias in our gardens. Nursery experts at Oregon State University call these land mollusks "basically a stomach on one large foot" that can consume several times their own body weight each day. A jaw like a guillotine and a scraper-like mouth part with thousands of backward-pointing replaceable teeth equip the slug with all it needs to reduce your beds of precious emerging dahlias to stubs and slime-tracks. The author of the Oregon State University Pacific Northwest Nursery Pest Management Site says of this nastiest of dahlia pests, "To sum a slug: It is magnificently designed to deconstruct." The personal lives of slugs can be fascinating. Slugs are trans-gender hermaphrodites which begin life as males but develop female reproductive organs at maturity. Slug courtship is an elaborate and sustained intertwining. Female slugs lay eggs, about a quarter of an inch or less in diameter, beneath wood or garden debris and sometimes in crevices or holes in the ground. Late-laid eggs can overwinter and hatch when the first warm rains occur. 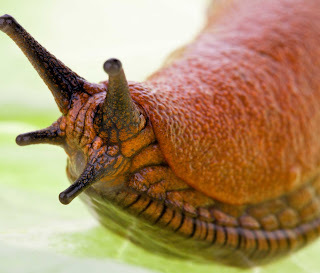 The slime that accompanies a slug is of two sorts; a slippery mucus offers ease of movement while a more viscuous version actually increases traction. What species of slugs you have to cope with depends on where you live. In the Northwest, the main culprits include the European red slug Arion rufus, and the great gray garden slug, tiger slug or spotted leopard slug Limax maximus. The Northwest's iconic banana slug, a slow-moving forest cleanup committee, rarely invades the garden. A preference for underground habitation makes slugs sneaky, and allows them to have at those tender parts of your dahlia where it emerges from the tuber. 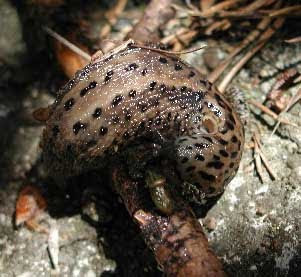 Slugs are largely nocturnal, and like rain. OSU nursery advisors suggest monitoring your slugs' activities, monitoring your gardens with a flashlight at night and checking daytime habitat under flower pots, debris or even stepping stones as well as under tall grass, ivy or other sheltering foliage. Controls include barriers such as copper strips, encouragement of predators including some birds and snakes, manual picking or stabbing, small boys with salt shakers, diatomaceous earth and lime, baiting with beer, and poisons including carbaryl, metaldehyde and methiocarb. The poisons, of course, are more effective than the organic methods. Lynch Creek Farm's growers suggest circling dahlia plants with a poison barrier as they begin to sprout. Slug poisons are most effective for the long term when used in late summer when cooling temperatures trigger mating and egg-laying activities. The side effects of the poisons, of course, include loss of beneficial critters such as earthworms, and the danger of poisoning birds and pets. Attempting to expanding my arsenal of nontoxic dahlia pest control weapons, I came across a recommendation by Valerie Easton, a Seattle Times magazine section writer. She rejects poisons and finds most of the other methods too time consuming; her ammo is a spray of one part ammonia and two parts water which, she claims, "disintegrates slugs almost instantly." Her ultimate solution, she adds, is to garden using only those plants that aren't subject to slug predation. If you want dahlias, you have to reject that option. The most effective garden treatment I have encountered was the most natural. When Mount Saint Helens erupted in 1980, one of the ash-plume events coincided with a rare southeast wind that brought a visible dusting of ash to Mason County. That summer our garden was virtually slug-free, and it was a couple of years before the slug population was back to its annoyingly normal level. Wouldn't it be nice to harness a mountain's power and have volcano-on-demand for your garden? It's appalling for someone who loves dahlias in everyone else's garden to fail to grow them. But I've failed, and done it time and again. 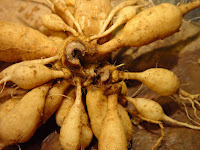 First, I inadvertently left a couple of dahlia tubers in the ground one fall. They came up the following summer, and bloomed nicely. Well, I thought, all that work isn't really necessary. I tend to garden on the Darwinian survival-of-the-fittest model: if it's tough enough to come up year after year, and survives duking it out with whatever else comes up year after year, it stays. This explains why I have such exuberant displays of things like coreopsis and crocosmia "Lucifer" and phlox "David." They'll grow anywhere, in any soil, and proliferate insanely without any cooperation from me. So, of course, when I left all my dahlias in the ground, they froze. A year or two later, I'd been feeling nostalgic about a red-and-white dahlia my mother and her Garden Club friends used to grow, a delightful single called "Union Jack," and I found a grower who had it. I planted it and waited with delight for it to grow. It came up, but it was a wet summer and the slugs damaged it so severely it died. It was a while before I tried again. By this time we'd moved to our present location, with a stream and reservoir across the alley, and a bunch of ivy on the slopes to the reservoir. This is slug and snail heaven. Every night armies of slugs and snails march into our garden, eating everything in sight. When the Lynch Creek gang began selling dahlia tubers, I got some waterlily dahlias, one of my favorite types, but knowing what damage slugs and snails could do, I broke the vows I'd taken to garden organically and surrounded the dahlias' territory with the latest slug killer. The dahlias sprouted. Oh, I was vigilant. I renewed the slug stuff every time it rained, and maintained a ring around the dahlias. One misty morning, I found the fledgling dahlias demolished. I was sure the malevolent molluscs couldn't have crossed the line; I was mystified. But the next day, mourning my dahlias and moping about the garden, I noticed two large snails on the fig tree whose branches spread out over the little dahlia bed. Make that dahlia graveyard. I'm not saying that snails have enough brain to climb the fig tree and drop on the dahlias, but it's as close as I can come to explaining how my dahlias got eaten. However, this spring, I'm going to try again. I just can't blog dahlias without realizing there are some of those treasures I've just GOT to try. Stay tuned. And if you've got some slugproofing strategies you'd like to share, please get into the comments box and pass them along! You cannot visit the public gardens in England without being bowled over by the perennial borders. One of the most celebrated of English gardens, and the one that has charmed us most, is the National Trust property at Sissinghurst in Kent. Much of its charm is in the seasonal nature of its gardens; the orchard is rampant with daffodils and other bulbs in spring, but simply a grassy orchard the rest of the year. The White Garden is never more dramatic than it is at the onset of summer when the gigantic white rose canopy is in full bloom. 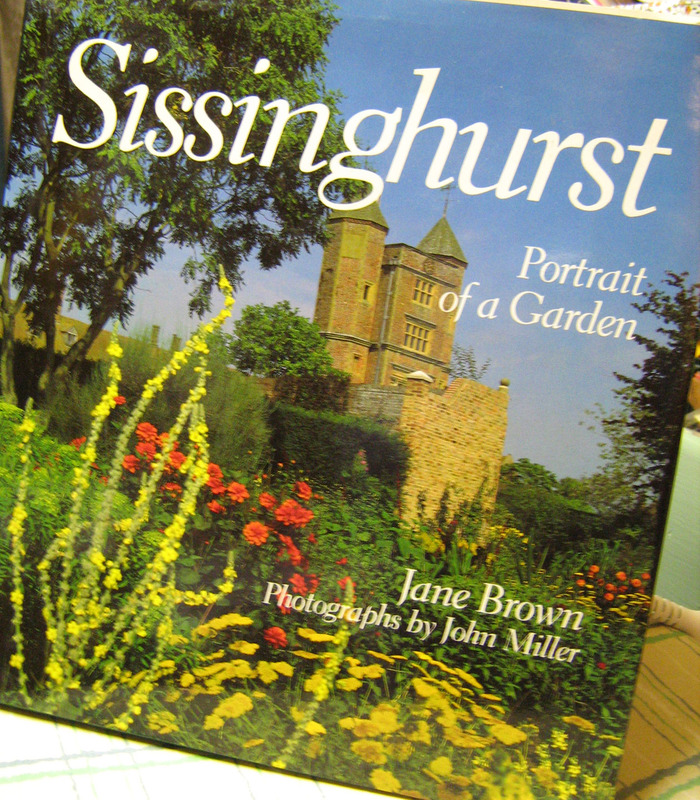 Well documented on public television, Sissinghurst was rescued from gloom and disarray by noted writers Vita Sackville-West and her husband, Harold Nicolson. While their long marriage may have been one of the stranger ones in history, the garden they developed together—his landscape designs, her plantings—were sublime. When their son Nigel Nicolson gave the property to the National Trust, it became a public treasure. Tony Lord deals with Sissinghurst's purple borders in his book Best Borders, and focuses on the property in Planting Schemes from Sissinghurst: Classic Garden Inspirations and Gardening at Sissinghurst. And featured above is Jane Brown's Sissinghurst: Portrait of a Garden with photos by John Miller. 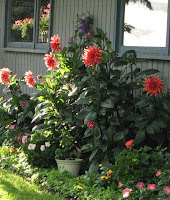 The books are full of dahlias incorporated into colorful borders. There's even a lovely white ball dahlia that helps carry the White Garden into the late summer. While the vibrant colors of dahlia blooms, and their long late blooming season, make them ideal for perennial-garden planting, some of them also have the advantage of interesting foliage. 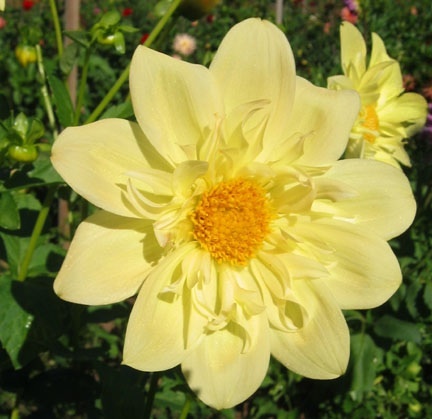 The Bishop family of dahlias are among those; check out Lynch Creek's Bishop of Oxford and Japanese Bishop. For a long while it was almost impossible to acquire some of the best-known English dahlias (they pronounce them day-li-ahs) in the Northwest, more are available all the time, and it's possible to find look-alikes for most of the ones we can't find. 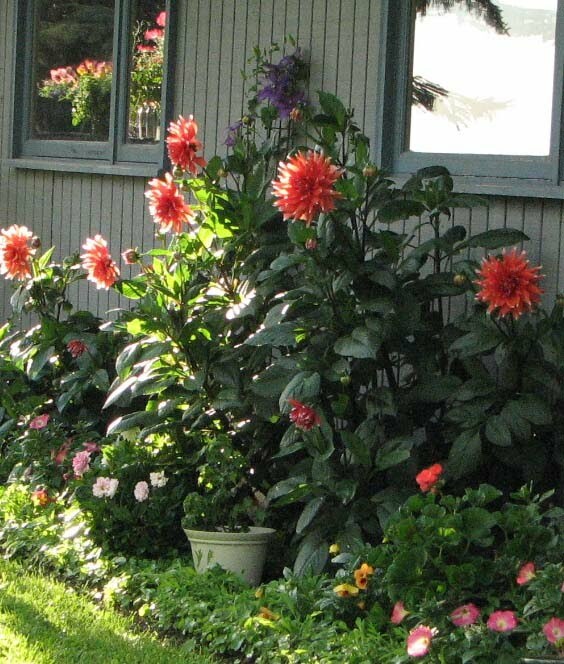 If you like the look and feel of lush perennial beds, be sure to make room for dahlias. It's frustrating to lose the name of a dahlia you've enjoyed. 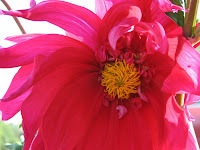 It's heartrending to lose the dahlia itself. Dahlia afficionado Shiloh McCabe purchased a vigorous potted plant at Bell's Nursery in Anchorage, Alaska, and delighted in the vibrant hot pink blooms it produced in the summer of 2009, a year she said was wonderful for flowers in her area. Her efforts to store the tubers that winter, however, were unsuccessful. And she couldn't replace it, she said, because she had not yet begun keeping records of the varieties she grew. It was about 40 inches high, and the luscious blowsy blossoms were about six inches across. It's unlike anything in the Lynch Creek inventory, and not typical of any of the standard dahlia forms; we haven't been able to locate a comparable bloom elsewhere. However, Andy suggests that it might possibly be a mutation or sport of Envy, a standout in the large and giant category. It appears to have underdeveloped florets around the center, which give it that open, semi-double appearance. If there's anyone out there who has developed, grown or seen a dahlia similar to this, please use the comment box below and share your information. Thanks! 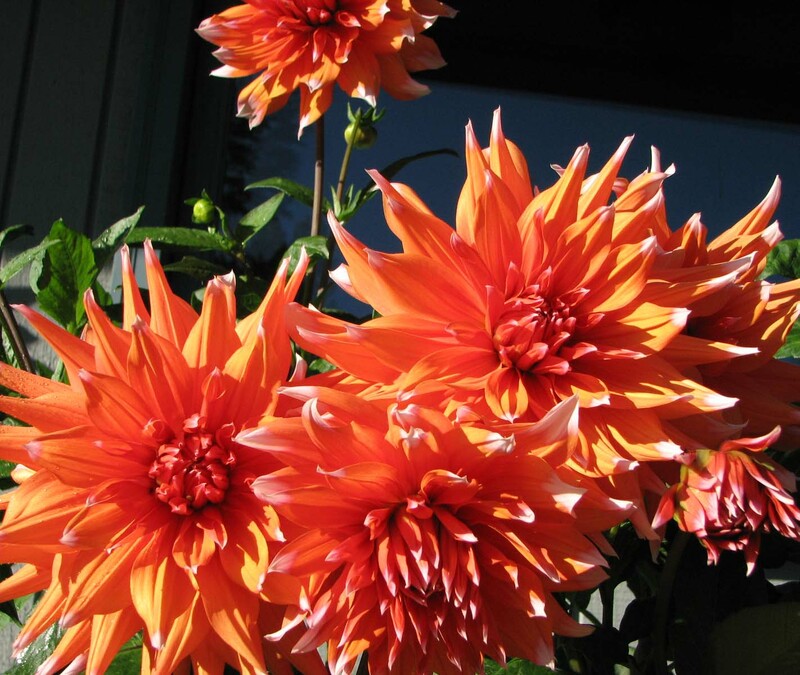 Alaskan Grows Great Dahlias in the Far North—And So Can You! At Lynch Creek Farm, the gang loves to hear from readers in other parts of the country and to find out how they meet the challenges of their climates. One such grower, whose dahlias are pictured here, is Shiloh McCabe, who lives in Anchorage, Alaska, where it's still snowy with nighttime temperatures around zero. "This time of year I start to go stir crazy and the temptation of dahlias haunts me!" she writes. "I can hardly wait to go outside and start moving snow around..urging the ground to thaw that much sooner." Last year, Shiloh says, she planted new dahlia tubers in pots on March 17 and began hardening them off at the end of April. "I moved them outdoors and put them in the ground on May 17," she says. "Planting them against the south facing wall really helps to keep them warm. They LOVE the long days and put on a beautiful show. I had to cut them back and put them in pots for winter during the third week of September. They are now dormant and waiting for spring...just like me!" 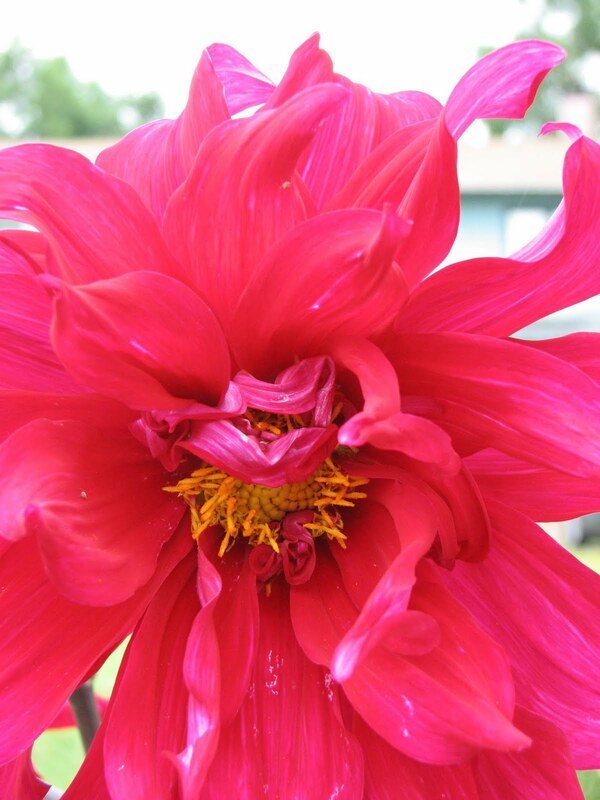 Pictured is her dahlia Color Spectacle. While she's waiting, she's enjoying a sunroom full of geraniums she's been propagating, as well as blooming abutilon. Like many of us who delight in our gardens, Shiloh likes to share commentary on her efforts. The comment boxes below offer a great chance to get into dialogue about your gardens—and your dahlias! When the weather’s beastly and wintry, and it seems like it’s gone on forever and stretches ahead for nearly as long, flower catalogues and websites are a great comfort. And actually, there’s a lot you can do indoors (besides the obvious: order Lynch Creek dahlia tubers) to get ready for your summer garden. Planning flower borders is a great delight, and dahlias are among the best of the border bloomers with their long, late flowering season. While a garden full of dahlias is a visual delight, these luscious flowers lend themselves equally well, if not better, to a mixed garden. One of our favorite garden spokesmen is Tony Lord, an English garden designer and writer. His book Best Borders is full of dahlias. Annoyingly, most of the frequently appearing English dahlias bear names unfamiliar to many Americans. Maybe there’s just very little exchange of plant stocks across the Atlantic. Often, as with many of our Ellis Island forebears, the immigrant is arbitrarily assigned a new name. But one can look at an illustration of a dahlia in an English book and find a look-alike to grow in the U.S.
Photographed above is part of Lord’s discourse on the red double borders at Hidcote Manor, a famed landscape garden in Gloucestershire. In Hidcote's red Double borders, red waterlily dahlias (very much like Cherry Drop) alternate with decorative grasses and orange daylilies; in front, adding a lighter texture and foliage contrast, are dark-leaved heuchera. In their basic form, they’re called coral bells; this one, however, is one of the purple-leaved varieties. 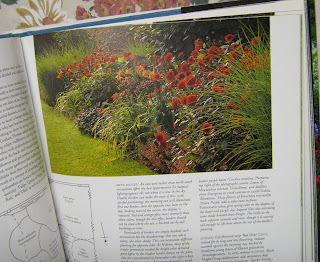 Planning a beautiful border might well involve a visit to the local library or independent bookstore. In Shelton, that’s the Timberland Regional Library and Sage Book Store. A stack of gardening books, a steaming hot cup of tea, and the prospect of spring and dahlia planting ahead: Let it storm, for the moment. We can dream dahlia gardens.